The Wife likes to go to Wal-Mart. I'm not a fan of Wal-Mart. But she is. And, when we're out, and when she gets the urge to go to Wal-Mart, we go to Wal-Mart. Often, when she goes towards the girlie stuff -- fabrics, notions, knick-knacks, paddywhacks, whatever -- I will often head towards the electronics section, mumbling, "I need to check on blah blah blah." Last time we went to Wal-Mart, though, I didn't. I followed along, pushing the shopping cart. She headed to fabrics. And I saw something I didn't expect to see. Other than me in the fabrics section, that is. She was looking at patterns. You see, I'm not sure how much, if any, of what patterns are I actually need to explain. So, if you know what I'm talking about ... well, you know what I'm talking about. If you don't know what I'm talking about, it's semi-see-though paper that has sections marked off that are used to cut fabric for sewing together to make something. For instance, on the shelf in the closet is a patter for a Star Trek Next Generation uniform that was going to be made for me for ... what? ... Hallowe'en? Star Trek convention? A gag? I don't know, but the uniform was never made and the pattern still sits on the shelf in the closet. Anyway, we were at Wal-Mart. The Wife went to fabrics, I followed her, and she stopped at patterns. There were McCall's patterns there. Didn't that used to be a magazine? My grandmother used to get McCall's magazine. I don't remember what was in it. Probably lady stuff. I do remember my sisters would cut out and play with the Betsy McCall cutouts inside the back cover. In 2001, Rosie O'Donnell got involved with McCall's magazine in some way, and it became Rosie magazine. It lasted a little over a year before it folded. Anyway, I thought that was the end of McCall's. 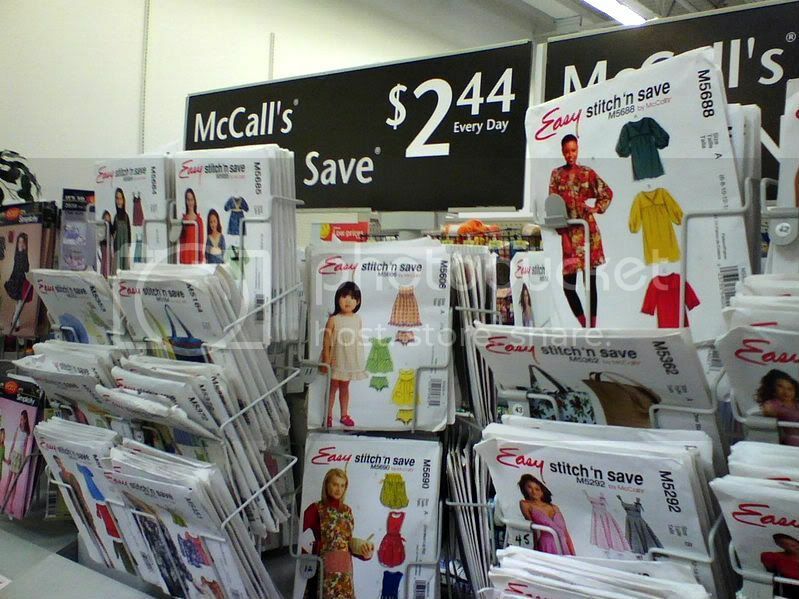 McCall's still does patterns, under the brands McCall's, Butterick, and Vogue. I smiled when I saw the McCall's patterns, because it reminded me of the old magazine that was at Grandma's house. The Wife bought some patterns. Maybe she'll make something. She probably will. Unless it's a Star Trek uniform. You can read a blog entry about the former Austrian actress Marisa Mell when she got a spread in McCall's Magazine!